Explore some of the finest restaurants in New Jersey at the 5th Annual Bloomfield Restaurant Week. The event will showcase a blend of old favorites and new “must-try” local eateries. Explore some of the finest local eateries at one of New Jersey’s best dining destinations. As Bloomfield prepares to celebrate the Fifth Annual Bloomfield Restaurant Week, it seems appropriate that the modern gift to celebrate the fifth anniversary is silverware. Taking place from Saturday, Aug. 6 through Sunday, Aug. 14, the event will showcase a blend of old favorites and new “must-try” eateries in one of New Jersey’s best dining destinations. More than 25 of Bloomfield’s finest restaurants will offer lunch and/or dinner prix fixe menus costing $30 or less, not including drinks, tax and tips. Extensive promotions for Bloomfield Restaurant Week will reach local residents as well as the neighboring communities of Montclair, Nutley, Glen Ridge, Belleville, Clifton, West Orange and beyond. Comcast Spotlight is a major sponsor and promoter of the event; watch for commercials beginning in July on Food Network and other local cable channels. There is a chance to Win a $100 Gift Card to the participating restaurant of your choice - get the complete details on the Bloomfield Restaurant Week Facebook page. All interested parents should contact the Bloomfield Recreation Department to be placed on the Drop and Dine list on a first-come, first-serve basis. PRE-REGISTRATION REQUIRED Contact the Bloomfield Recreation Department Mon - Fri, 8:30AM - 4:30PM, and Wednesday Nights 6PM - 8:30PM and Online registration @ http://www.bloomfieldrecreation.org Payment can be made over the phone at (973) 743-9074 via credit card or paid by cash, check or credit card in person at the Bloomfield Civic Center, 84 Broad Street. 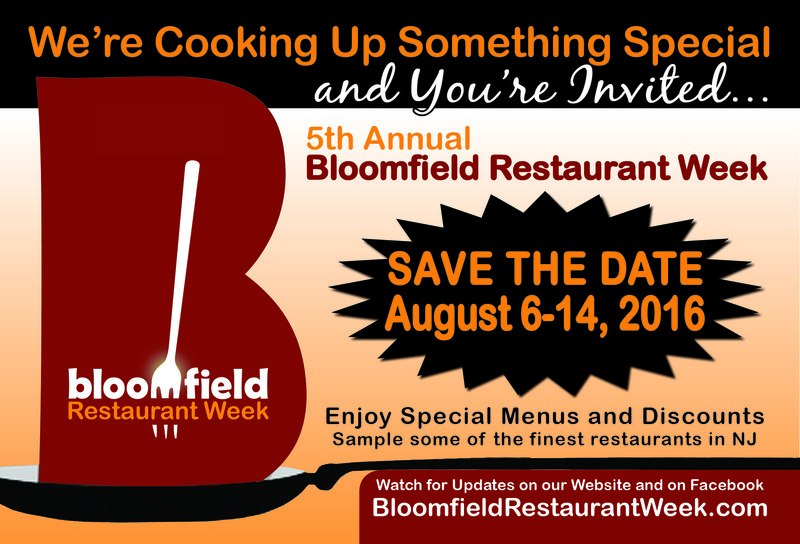 Free parking for all participating restaurants during the entire Bloomfield Restaurant week courtesy of the Bloomfield Parking Authority SATURDAY 8/6 – SUNDAY 8/14, There will be two hour complimentary parking beginning at 11:00 am at all bagged meters. Please adhere to the two hour courtesy parking limit. Time limit will be strictly enforced.